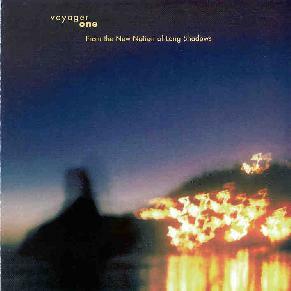 Voyager One - "From The New Nation Of Long Shadows"
Here's an album from the anglophilic slowcore end of the American spacerock scene (betcha didn't know that existed... me neither!). Most of the album easily sounds like it could have come out on a late-80s/early-90s UK label like Creation, Fire, or Too Pure. Think of My Bloody Valentine (although the sonics are never quite that thick), Ride (they don't quite rock as hard), Th' Faith Healers (without jamming quite as intensely, despite some extended tracks), and you know what their good stuff sounds like. There are some very nice fuzzy drone-pop songs on the album that ought to appeal to spacerockers as well as those into indie bands like Yo La Tengo. Unfortunately, as someone who's never been too much of a fan of Morphine, Slowdive, Red House Painters, Galaxie 500, American Music Club, or (gak!) the Smiths/Morrissey, some of the album is just too morose for my taste. Fans of the aforementioned, or of some of the gentler spacerock bands on the Kranky label, however, owe it to themselves to investigate Voyager One. But the cover of "Daytripper" has to be the most gratuitously slowed-down overly-melodramatic Beatles cover since Deep Purple's version of "We Can Work It Out" (two songs that, coincidentally, originally appeared on opposite sides of a 45rpm single!) or Vanilla Fudge's numerous stabs at the FabFour's tunes. Their own compositions are tuneful enough anyway, so what do they need a cover like that for? And it's good to know that they can freak out a bit, as on the sound collage and outro portions of "Poisoner's Waltz". Produced by William Bernhard of Head Full of Stars. For more information you can visit Voyager One at their web site. Contact via snail mail c/o Loveless Records; 1122 E. Pike #1361; Seattle, WA 98122.